Tablets 2.0: time for the next gen? Does the Transformer Prime represent a new era for the Android tablet? It's been an exciting week for Android fans: we've seen the shape of things to come, and it's a vehicle. 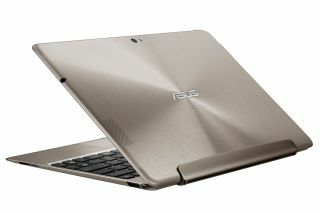 That's what Gary Marshall reckons, anyway: according to him, the new Asus Eee Pad Transformer Prime eschews me-too design "and turns into a truck". It doesn't really, but its blockbuster movie branding doesn't stop with references to robots in disguise: the Transformer Prime also boasts a Superman-inspired Kal-El processor, better known as a Tegra 3. That delivers not one, not two, but four cores (and an extra secret one), and its 12-core GPU should deliver exceptionally tasty graphics performance. It's the first time we've seen a tablet rocking the Tegra 3, and despite its impressive engine the Transformer Prime remains super-slim - it's just 8.3mm thick - and marginally lighter than an iPad 2. It's got a great screen, too, delivering an exceptionally bright 600 nits in "Super IPS" mode. Asus also promises dramatically improved hardware performance, and says that input lag has been halved. That's important on Android, which has never been quite as smooth as Apple's iOS. If you think stuffing a Tegra 3 into a tablet is impressive, wait until you see what HTC's been up to. The HTC Edge will be the world's first quad-core smartphone, which makes the current state of the art, the Tegra 2, look positively puny. It's just as well smartphones have so many apps, because quite frankly using a multi-core processor to call your mum or text your partner is a bit over the top. Between the HTC Edge, the slightly less impressive HTC Ville and the Transformer Prime, it's clear that the future of Android smartphones and tablets is looking rosy. It's a shame we can't say the same for Flash. Flash is Adobe's platform for delivering animation, video and applications, and this week Adobe announced that it was killing it. The firm didn't use those exact words - "We will no longer continue to develop Flash Player in the browser to work with new mobile device configurations," it said, explaining that the forthcoming Flash Player 11.1 for Android and BlackBerry PlayBook would be its last - but industry watchers believe that's the end of Flash on mobile devices and the beginning of the end for the desktop version too. It certainly makes Flash on devices such as Sony's PlayStation Vita look unlikely, and it raises a big question mark over Flash on devices such as smart TVs. The internet was quick to credit Steve Jobs, whose 2010 Thoughts on Flash letter explained why Apple wouldn't let Flash onto its iOS devices, but our columnist Gary Marshall wasn't so sure. To him, Flash was like an aged rocker: ten years ago it was playing stadiums, and now it's struggling to fill a phone box. Stopping development of Flash Player "is a bit like a pop star saying that from now on, they'll only sell records by mail order to their fan club: while Flash will persist on PCs, where it has a large if ageing fanbase, as far as the cool kids with their mobile devices are concerned it might as well be rationing, Betamax or skiffle. The future of tech is mobile, and Flash Player isn't in that future." Marshall came to praise Flash, not to bury it. "Flash was very necessary for a very long time," he said, arguing that "as it evolved it became an enormously powerful tool... [it] was the tool of choice for people who wanted to push the web forward." However, as web standards such as HTML5 improved, Flash's niche grew smaller. "It's a sign of technological progress, a disaster for any firm whose 'it runs Flash!' claims are their devices' only selling points, and a sad day for those of us who like punctuating columns with references to amusingly pompous Queen records," Marshall says. "FLASH! A-AAAAGH! See what I mean?"